Sometimes a little one’s help is more than the adults can handle. Lucky for Anderson’s little frog, his mother is patient enough to accept all the help her son has to offer. Turns out, he likes to help a lot. Whether doing errands with Mommy or helping Daddy outside with chores, the cheerful narrator’s enthusiasm never wanes. 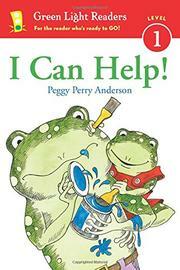 Young helpers will enjoy noticing the tension between the repeated refrain of “I can” and the actual “help” depicted. When picking up the dry cleaning, the overalls-clad imp hangs upside down from the plastic sheath, and when shopping, he adds five boxes of Frosty Flies cereal to the cart and drags the too-heavy bag by one handle, certainly causing a spill. While most youngsters will no doubt get a kick out of watching the “helpful” frog, their adults will likely flinch at the firmness of the gendered division of labor in this family. Is Mommy the only one running errands during the day, and is Daddy the only one who can handle nails, paint, and garden equipment? Though the story runs to only 32 pages, the repeated refrain slows its pace and lends it a feeling of monotony. Full-color illustrations lift the repetitive story and celebrate when, in the end, the little frog really does create something pretty special with some recycled jars.